Quípama is a municipality in the Colombian Department of Boyacá, part of the the subregion of the Western Boyacá Province. 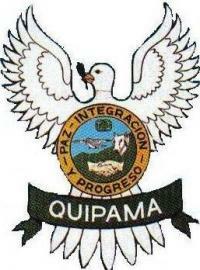 Quípama was first founded in 1541 Captain. Luis Lanchero but was destroyed. It was re-established as "Tudela" by Captain Pedro de Ursúa in 1551 but destroyed again. The current municipality was founded in 1558 by Francisco Murillo as "Trinidad de los Muzos". Until 1986 it was part of Muzo when it became a municipality according to decree 28. The flag is white with dark green borders and is charge with green emerald in its center.